I'm not a big props-in-the-pulpit guy. Maybe I witnessed too many Trinity Sunday sermons growing up where the preacher would mess up some analogy using three tapers or three cups of water and I'd end up more confused than ever. But I did use a prop at our midweek Eucharist on St. Andrew's Day (November 30). I was talking about Andrew, the first apostle called by Jesus, which led to the well-known St. Andrew's cross, which led to my hauling out an old Episcopal Church flag that resides on the top shelf of a tall cabinet in my office. I think the flag in question was replaced in our nave by a newer flag a number of years ago and, since we never throw things out in churches, it was naturally placed on a virtually inaccessible shelf in the rector's office. Please don't question it. That's just how things work. 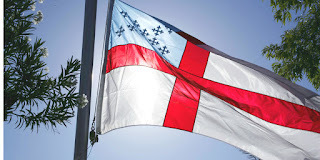 Many people know the symbolism behind the Episcopal Church's flag but many have no clue so I thought I'd say a few words about it. 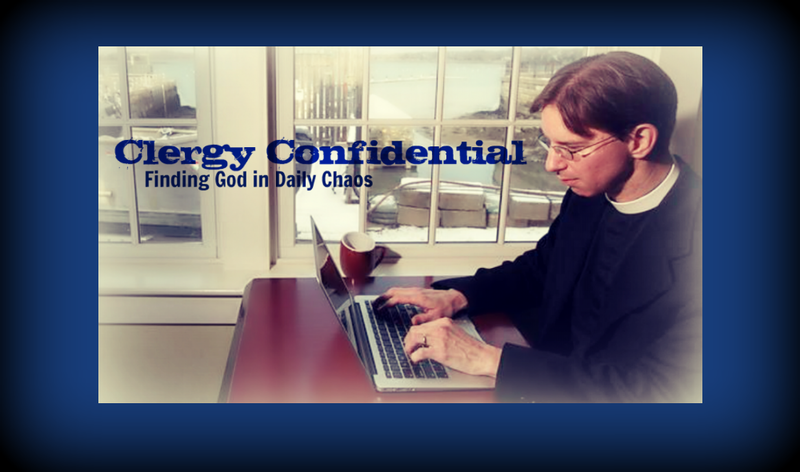 Plus, I'm teaching an Episcopal 101 class to newcomers this Sunday so these sorts of things are on my mind. The first thing you should know about the Episcopal Church flag is that it's a relatively recent addition to our church. It's not as if in the aftermath of the American Revolution, the clergy and laity sat around thinking, "Let's see. We need a new Book of Common Prayer, a Constitution, Canons, and, oh right...a flag!" In fact the flag wasn't approved for use until 1940. Just imagine that General Convention -- they approved both a hymnal and a flag! needed one -- but it was designed by William Baldwin, a member of the Cathedral of the Incarnation in the Diocese of Long Island (NY). And I, for one, love the design of this flag. 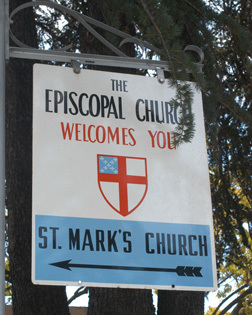 It's become iconic partly because of the flag itself but also because of the iconic "The Episcopal Church Welcomes You" signs that you can still spot all over the country. So what's the symbolism involved and why was I mentioning this on St. Andrew's Day? I'm getting to that last part, be patient. The large red cross on the white field is the Cross of St. George, the patron saint of England. That makes sense, as we are members of the worldwide Anglican Communion, directly descended from the Church of England. It's been speculated that the white on the flag represents the purity of the Christian faith while the red is symbolic of the sacrifice of Jesus and the blood of the martyrs. Maybe that was Baldwin's intent or maybe it's a later explanation but either way, it works. The light, sky blue is the color associated with St. Mary (who says Episcopalians don't take Mary seriously enough? She's on our flag!). 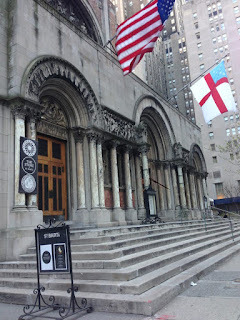 The nine white crosslets represent the nine original dioceses that made up the Protestant Episcopal Church in the United States following the Revolution (Massachusetts, Connecticut, New York, New Jersey, Pennsylvania, Maryland, Virginia, Delaware, and South Carolina). In hockey terms, these would be like the Original Six (Boston Bruins, Chicago Black Hawks, Detroit Red Wings, Montreal Canadiens, New York Rangers, and Toronto Maple Leafs). Anyway, these nine crosslets are arranged in the pattern of a St. Andrew's Cross (or Saltire). Why? Because when the fledgling American church needed a bishop they couldn't send a priest to England -- the ordination rite required allegiance to the king. A major problem! So Samuel Seabury of Connecticut was sent to Scotland (ding, ding, ding!) to be consecrated in 1784. Legend has it that, when it was time for his martyrdom, St. Andrew believed himself unworthy to be crucified in the same manner as his Lord. Thus he was bound, rather than nailed, to a cross in the form of an "X." But why, you ask, is St. Andrew the patron saint of Scotland? Because it's said his relics were, by divine guidance, transported from Constantinople to Scotland. In any event, there has been a strong connection between the Scots and St. Andrew since as early as the 8th century. Hence the Scottish flag prominently bears the cross of St. Andrew. So you see, this has all come together quite nicely. I had a prop for my homily and perhaps you've learned something about St. Andrew. Or at least the Episcopal Church flag. That was a nice article, father.